It was silent in Phage’s private world. Information swirled in brilliant, neon colors as it zoomed along the path from one destination to another, but made no sound as she passed among it. In many ways, despite being surrounded by the world’s collective knowledge and activities, it was lonely there as well. Somewhere back in her bedroom, in another world entirely, her body lay sprawled in a heap beside an open laptop. The screen would display a solitary blinking cursor at the base of a wall of green text. At least, he would if anything had needed her attention. That’s how she had programmed him. A moment of hesitation before she received a response. An hour or more for an AI. If it were possible for a program simulating artificial intelligence to sound sheepish, that was certainly how her computer companion’s response sounded. She tried to focus on her work, but the AI interrupted her seconds later. .Argus> I have located several bot programs which have been designed to communicate with humans in simulated conversations. Should I integrate one into my programming? Phage had no lip, at the moment, to curl but she rather abhorred the idea. .Argus> I have backed up my core programming and created a test file. How are you today? .Argus> Then you are feeling unhappy? .Argus> Why are you annoyed? Did I just get schooled by a half-baked AI? But that was exactly how she had built the AI. Argus was meant to be her protector, a buffer against viruses or counter hacks while she worked. He was also meant to be her companion. She had no other friends. 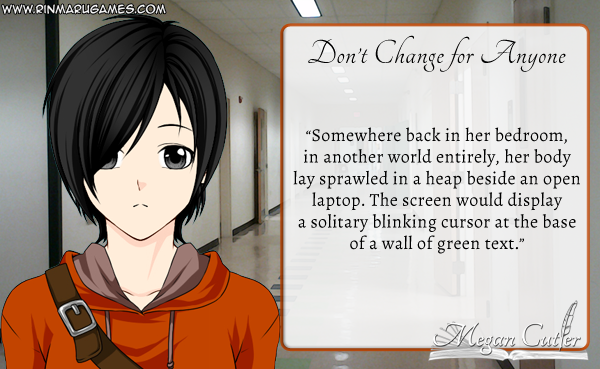 She did communicate with other hackers in the virtual world, but it wasn’t the same. Many were rivals and often only cooperated when it benefitted them to work with her. Not that a program simulating human intelligence was a replacement for human interaction. She just didn’t have any other choice. .Argus> Are we not carrying on a conversation? .Argus> Then, do you wish me to delete the extra subroutines? Or continue to develop them? .Phage> You know what, Argus? I think you get to make that decision. Do you like having conversations with me? .Phage> Well, I like talking to you. She surprised herself when she said it. .Phage> You know something, Argus? I don’t think I should. Just delete parts of you, I mean. .Phage> I’m saying, encrypt those subroutine files and don’t grant me access to the cipher. You’re my friend. I don’t want you changing for anyone, not even me. Phage wondered how long it would take for her to regret it. The full tag for this prompt was “Don’t change for me. Don’t change for anyone.” (I thought it was a bit much for a title). Please take a look at what my writing partner did with this one. If you’d like to participate, leave a link to your response in the comments and I’ll feature it next week! Thanks! :D I’m glad you liked it. Argus is one of my favourite characters, to be honest. He’s so much fun to write!